We believe that children need a healthy balanced diet in order to grow and develop. We therefore serve a varied diet at the Lighthouse Nursery and use fresh food almost exclusively in order to keep additives, salt and added sugar intake to a minimum. 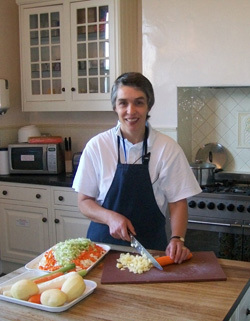 Our cook, Penny, is fully qualified and uses only high quality ingredients which we source from Sainsbury's. We serve high quality produce such as red meat, chicken breasts, cod / salmon loins on a weekly basis and do not include 'cheap solutions' foods in our meals such as breaded, reconstituted or processed food or ready meals. Vegetarian diets, allergen free diets - for example dairy or gluten free - can be provided by prior arrangement as can medical, Halal or other religious or cultural diets. 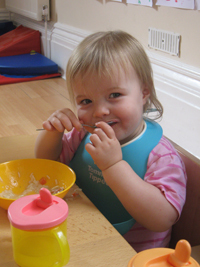 Weaning Meals: Young babies eat exclusively home prepared meals and we follow the Department of Health's weaning guidelines and parental direction regarding when new foods are introduced to their diet. Because we make our own food, we can gradually increase the lumpiness of the textures to suit an individual baby's stages of development and introduce finger foods at the appropriate time. “Children develop hearty appetites, eating nutritious and healthy meals and snacks, cooked using fresh produce on the premises”.